Your very own oceanfront, sandcastle, "ONE" Kings Grant, 4,000 Sq. Ft of living space. 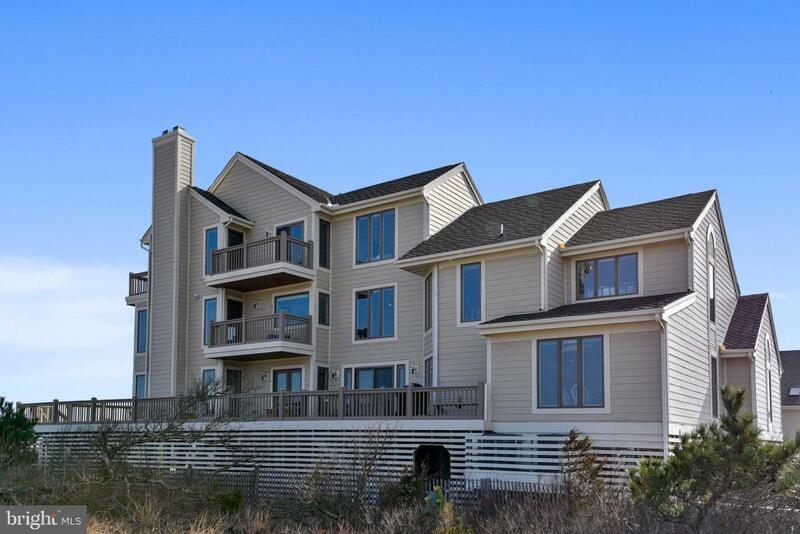 This unique property is designed to capture the panoramic views and serenity of the seaside and bay with unobstructed views of the dunes from within and from the many wrap around decks. Nothing is between you and natures breathtaking beauty for a mile and a half. Enjoy the luxurious "feel" of a single family home with its own private entrance yet the ease of a no maintenance, no worries, townhome. This extraordinary home has 6 bedrooms, 2 fireplaces, an upscale kitchen, open dining area, living room, family room, a breakfast /tap room, including wet bar with double beer taps for domestic or imported beer; plus, 6 1/2 baths and a private outdoor shower. There are also 2 quiet sitting areas on two of the upper interior levels offering a getaway on each floor. Experience the convenience of Lutron Electronics, with programmed lighting and shade control in the living room, entry area, dining room, and kitchen. Complete with audio speakers throughout. In addition, there are expansion possibilities on the third floor for an additional bedroom and full bath. There is plenty of room for guests and entertaining, providing undercover parking for 4 cars. This home is the northernmost oceanfront home at Kings Grant, built by the original developer as his personal home. To say the views of both the ocean and bay are incredible, is an understatement. Over the past several years the owners have extensively remodeled the residence , to create additional spacious interior living areas. There still exists expansion capabilities should someone want to enlarge and utilize the additional unfinished space more suitable for their needs or growing family. The Kings Grant community boast very few units; 75 total residences are either directly on the oceanfront or bayfront with usage of both. Enjoy strolls on the never ending beach, canoe or kayak on the bay via the private pier or relax by the sparkling waters of the pool. Make "ONE" Kings Grant your dream come true. Exclusions Art Mccoy Umbrella Stand Front Entry Oyster Plates (3) Dining Room Wall (2) Large Glass Fish Living & Family Room Glass Bowl On Living Side Chest Soup Terrine Dining Room Buffet Cedar Chest Front 2Nd-Floor Bedroom Exercise Bike And Exercise Equipment 3rd Floor Specific Wine Glasses Printer in Master Margarita Maker Other Personal items.